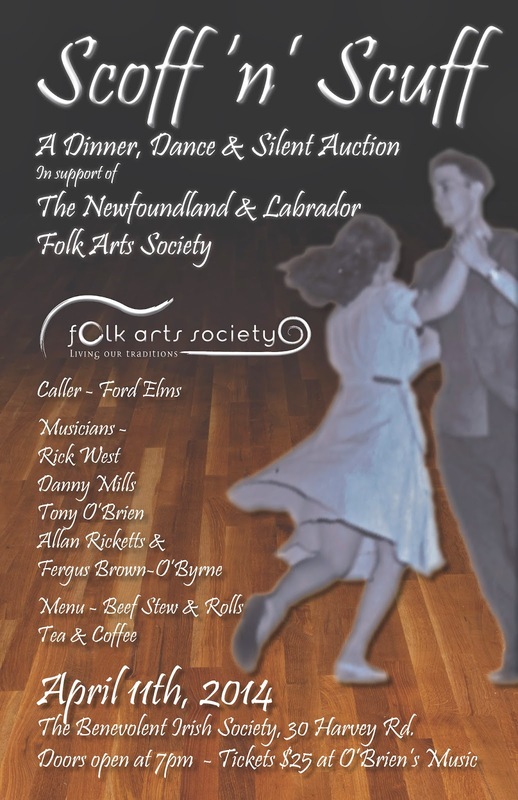 The Newfoundland and Labrador Folk Arts Society invites you to a dinner, dance & silent auction. Traditional dance caller, Ford Elms, will lead the way, with musicians Rick West, Danny Mills, Tony O’Brien, Allan Ricketts & Fergus Brown-O’Byrne providing the tunes. Enjoy hot beef stew and rolls, and bid on some fabulous silent auction items. Spring may not be here yet, but you can put some spring in your step to coax it along! Now in its 37th year, the Newfoundland & Labrador Folk Festival takes place in St. John’s on the weekend following the Royal St. John’s Regatta. It is the second oldest continuously running folk festival in Canada. Each year, the NL Folk Festival brings thousands of people together to celebrate the best in traditional and contemporary folk music and dance. The Folk Arts Society promotes folk arts in Newfoundland & Labrador and throughout Canada. The Newfoundland and Labrador Folk Arts Society (NLFAS) is a charitable organization located in St. John’s, NL whose mandate is the promotion of the traditional folk arts of the province. Active Since 1966, the organization works towards its goals by presenting educational and cultural events that provide artists with the opportunity to showcase their work and that engage our youth and the general public in the transmission of our intangible cultural heritage. The NLFAS produces the weekly Folk Night at the Ship Pub and several annual events including Young Folk At The Hall, the Holiday Wassail and the popular Newfoundland & Labrador Folk Festival. The 2010 Folk Festival received the City of St. John’s Event of the Year Tourism Award, and was voted Best Volunteer Opportunity by readers of the Scope.